Embossing ink is a clear, sticky ink that is used to hold embossing powder in place, so it can be melted. Embossing ink can also be used without powder to create a tone-on-tone effect. But is there a type that is better than the others? Today, I'm hoping to provide you with this information. 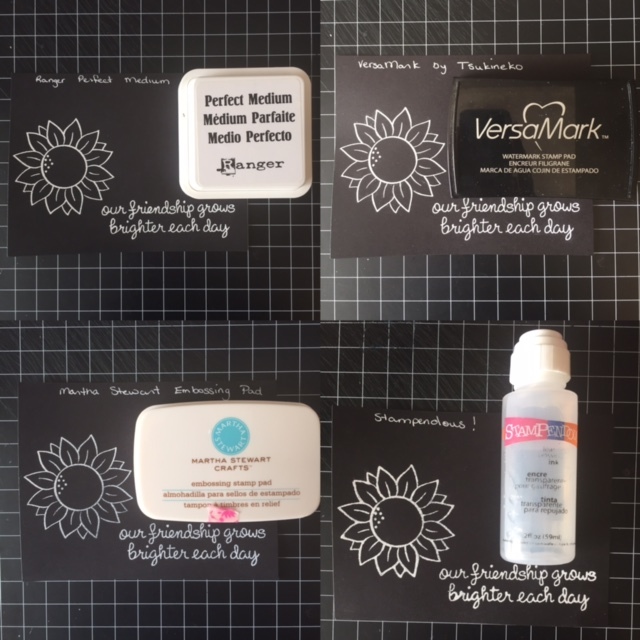 I'm going to compare four different brands of embossing ink and will share my impressions of each. To keep this comparison at a somewhat reasonable length, I will only be comparing their traits for use with embossing powder. It's going to be a long one, but I hope you find it worth it. All four of these inks I purchased at different times from my local craft store and they seem to be easy to get a hold of. I'll go through each of them showing the stamping and my observations while using each. For the purposes of this comparison, all the stamping was done on 65lb black cardstock by Recollections. All panels were prepped using a powder tool to discourage powder from sticking where I don't want it to stick. The stamps used are from Lawn Fawn's "Our Friendship Grows". I have used the small sunflower and the long sentiment. Here are all the finished panels with their respective inks together for easier viewing. If you already own the Ranger Perfect Medium because you have purchased the Perfect Pearls, don't feel the need to go out and purchase a separate embossing pad. The Perfect Medium works wonderfully. From the results of this comparison, I wouldn't recommend either the Martha Stewart or the Stampendous embossing inks. I found them blotchy and inconsistent in their stamping which resulted in poor adhesion of the powder and poorly defined final results. If you are in the store and you don't currently own an embossing ink, I'd recommend whichever is the better deal (the VersaMark or the Perfect Pearls) - just keep in mind that at some point you will need a refill. So find what will be better for you in the long run. I hope you enjoyed today's review. If you haven't already, please follow me over on the right side bar so you don't miss any future product reviews and projects, if you are viewing this via mobile device, scroll to the bottom and click "View web version" first. You can also follow me over on Facebook. If you have any questions about this review or have a suggestion for a future review please leave me a comment in the section below. I love to hear from you. *Disclaimer: I am not sent products to review, nor am I paid to review them. I review the products that I find interesting and that I purchase myself with my own money; and I receive no incentive, reward or payment to do so. All reviews are based off of my personal experience using the product and are my opinions only. This was a great review! I use Versamark, as well, and find it as good as you do. I have also seen other embossing inks, but now that I've seen your review, I'm sticking (pun intended!) with Versamark! Thanks! thanks for the review. I bought the Stampendous (before I read this review) in the dauber and it's useless, if you ask me. I'll be buying the Versamark next.